My dog career started in second grade. A field trip to a local kennel of Malamutes was eye opening. I had no idea that one could be a dog trainer. The bond between the kennel owner and his dogs struck me immediately and I was hooked. When the dogs became excited with all the kids, it was most impressive when he was able to quiet the group of dogs with a command. My next training adventure involved my grandmother’s dog. A lovely black Cocker Spaniel who would freely bite anyone except Grandma and myself. I quickly learned the use of positive reinforcement as it definitely helped with his attitude. Occasional opportunities with friend’s dogs kept me interested in training for the next several years. I began training professionally in 1976, starting my own training business after graduation from a dog training academy, earning the top scores in the graduation competition. I began by offering exclusively in-home training. In 1980 I was able to secure a spot on the staff of Leader Dogs for the Blind of Rochester, Michigan. After 16 months in the dog care department, I was offered a position on the training staff, progressing from apprentice trainer to senior instructor. During that time I was privileged to work with an outstanding group of guide dog trainers and gained an invaluable amount of experience working with over 500 blind students from all over the US as well as other countries. 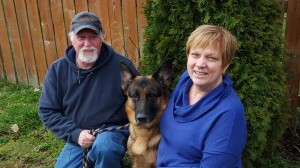 Gail and I have been training dogs and their people together since 1983. Our private training business expanded to include dog training classes offered through the Rochester community education system. In 1991 an opportunity arose which enabled Gail and I to move to Arizona to run the Eye Dog Foundation. At this point Gail stepped into several jobs at once. Her primary role as Puppy Program coordinator included managing the breeding program as well as the education and supervision of the foster puppy raiser families. Gail also became an invaluable part of the training team. Working with the guide dogs as well as the blind people gave her a chance to use her training skills with the adult dogs she helped raise as puppies. In 1993 a chance to be part of the guide dog school in Madrid, Spain gave Gail and I an opportunity to show our children another culture and a training challenge of a different kind. I served as the training director of Fundacion ONCE del Perro Guia for about one year before we returned to the USA. We restarted our training business immediately, continuing private training and group classes. In 1996, Gail and I returned to the Eye Dog Foundation in Phoenix, where we stayed until the end of 2005. Our private business continued on a smaller scale, focused exclusively on private training. Within the scope of that business, I had the privilege of working with the security team at Scottsdale Healthcare in Scottsdale, Arizona. In that capacity I held two jobs; training instructor for the dog handlers and designated bad guy. Training with police canine teams, as well as Schutzhund and Ringsport clubs afforded me the opportunity to work with elite handlers and their dogs. Centralia Pet Resort opened April 1, 2006. Since that time, Gail and I have offered dog training at our facility in Centralia. We focus on the family dog, teaching classes in all phases of obedience from Puppy Kindergarten to Advanced Obedience. Through our extensive guide dog training experience, as well as over 30 years of working with hundreds of families and their dogs, we have developed effective and humane training techniques that you can use to train your own dog. Our training programs are designed for each individual dog and their family. We use a combination of private training and group classes to teach you how to train your own dog. Private lessons can be done at our facility or in the convenience of your home. We have a heated and lighted indoor training area as well as outdoor fields for obedience and agility.